As Holi was celebrated with great fanfare in the country, police forces were strengthened across the country. While the observance calls for large-scale celebrations, unfortunately, the past has multiple times in the past seen a rise in cases of assault and quarrels. In a bid to thwart any such incident, most city police forces in the country deployed officers who overlooked the celebrations. Mumbai Police known for their social media presence took to Twitter with witty warnings urging people to celebrate Holi in its true essence and stay away from any wrongdoing. Twitter handles of police forces in Rajasthan, Assam, Nagpur and Hyderabad all tweeted Holi wishes along with traffic advisories. Most of the tweets asked people to stay away from hooliganism and the importance of consent. 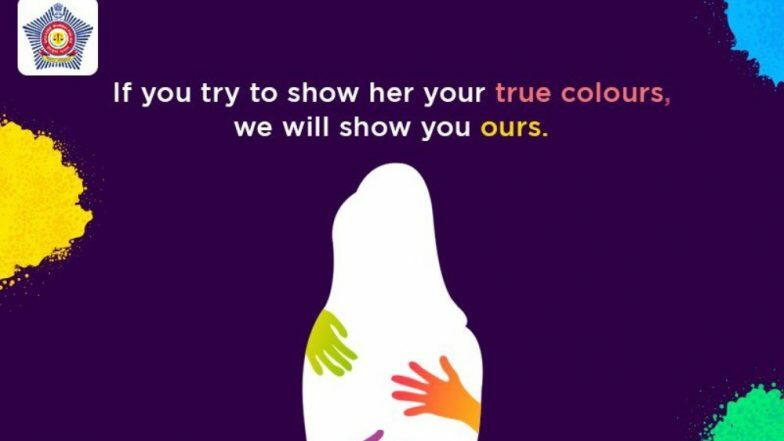 Assam Police's tweet reads, "Because, Consent doesn't take a Holi-day. Nagpur city police put up witty tweets against drinking and driving. Holi 2019: How NOT to Celebrate Holi This Year – A Guide. And yes, we are there to check ! Holika Dahan was observed on March 20 this year following which the next day was celebrated as Holi on March 21. The festival which is believed to be a harbinger of Spring and a thanksgiving for good harvest. The observance has various Hindu mythological stories attached to it and denotes the victory of good over evil. Holi was celebrated across the country with various traditional customs and celebrations.